Yerevan, October 15, 2015 — The Hayastan All-Armenian Fund has begun the construction of a state-of-the-art oncology center in Stepanakert. 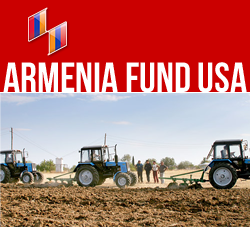 The project is sponsored by the fund’s French affiliate, with additional financial support from the government of Artsakh. Having laid the foundations, crews are now building the ground floor of the facility, which is located on the same campus along with the Stepanakert Republican Hospital and the Stepanakert Policlinics. The Oncology Center of Stepanakert will comprise three floors, with a total area of close to 2,520 square meters, and will be connected to the Republican Hospital via the ground floor. The center will offer the full complement of oncological diagnosis and treatment services, with the exception of radiotherapy. According to Dr. Armen Hayriyan, NKR’s top oncologist and executive director of the Oncology Center, annually more than 700 cancer patients receive inpatient care at the center’s old building, which is a run-down, 1960s structure sorely lacking modern amenities. Given the old facility’s limited capabilities, Dr. Hayriyan says, many patients opt to receive treatment in Yerevan or even abroad. Currently a staff of medical professionals are being to receive advanced training in France. “The new Oncology Center is poised to be one of the best in the region,” Dr. Hayriyan says. The center will comprise general and clinical-pathomorphology laboratories; X-ray, mammography, and MRI departments; and departments of surgery and intensive therapy, including chemotherapy. The facility will have 35 patient beds. The French-Armenian community continues to sponsor major health and education projects in Armenia, including Artsakh, for example: Zangezur Cardiology Center, in Armenia’s Goris Region; and the Yeznik Mozian Vocational School, in Shushi, a critically needed, ultra-modern institution which officially opened its doors some weeks ago.